Assimilative (attending to academic content), Finding and Handling Information, Communication, Productive, Experiential, Interactive/Adaptive and Assessment. Click here to go straight to the activity video. This tool very much focuses on revealing what it is anticipated students will actually do to learn, rather than what might happen at a cognitive level (i.e. think, reflect, consider). Clearly all the tool can do is capture design intentions (for example we might develop an activity using a forum where we expect students to communicate their ideas and understanding with others but find that 70% only read (assimilated) the posts of others, and didn't really communicate their ideas themselves) but this doesn't lessen the tool's potential impact on design. The purpose of the tool really is to support us in making absolutely explicit to ourselves and others, what our expectations are about what student will do to learn. In this activity you will first quickly sketch out a course/ module overview, and then begin to work out in more detail how activity will be distributed to support learning in your context. There is a introductory video for this activity below and you can download the spreadsheet tool in Excel or Google doc formats (go to edit and 'make a copy' ).If you are interested in reviewing other taxonomies of learning that may be used in a similar way (and there are several) you could start with the 8-LEM model from the University of Leige. This activity has been developed as part of the JISC funded OLDS-MOOC and is freely available for remixing and reuse. To go back to OLDS-MOOC week 3 click here. In this activity you will use the representation to help you think about what you intend learners to be doing to study and plan how you might implement the profile in your design . You can also use the tools to review a module or course prior to redesign. In doing this you can not only discover what learners are actually spending their time doing in comparison to what you hoped or thought they’d be doing but also explicitly and thoughfully plan how they will spend their time once the module or course is redesigned. You can either use the pre-designed spreadsheet or just paper and pens is fine – either works just as well - in fact if you are working as a design group around a table, you may find paper and pens a better solution! You can download the OULDI spreadsheet from the project website at www.open.ac.uk/blogs/OULDI . There are 3 worksheets in the spreadsheet. Called Predict, ‘As is’ and Plan. In this activity we will use 2 – Predict and Plan. 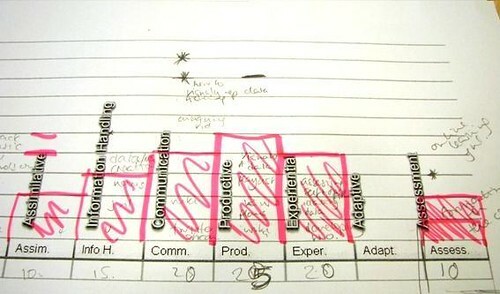 By the end of this activity you will have 2 bar chart representations showing you the proportion of time learners spend engaged in each activity type; the first will show you what you expect the overall distribution to look like and the second will show you how activity types will be distributed across the module, unit or course you are working on. As with all the OULDI learning design tools, the process you go through in sketching out the representation – the conversations you have, the decisions you make, and the implicit assumptions you reveal are important activity outputs – so make sure you jot these down as you work through the design activity. 1. Begin by quickly calculating how many taught and directed study hours there are in your module or course as a total. 2. Then quickly sketch out what you anticipate students will be doing through the module or course. Will they be collecting and analysing data? Communicating their ideas and learning through discourse? Will they be engaging in role play or adaptive scenarios? Reading texts, or watching podcasts or lectures? How long will assessment tasks take them to do across the unit or course? 3. Check that your total numbers add up to the right amount and make changes in necessary. 4. Next take a step back and look at your work. Begin, to ask questions about some of the assumptions you’ve made and check these out. Make some notes as you go. 5. Next use the Plan worksheet. You decide how you want to break the student journey down. For example you may want to break the course or module into themes, topics, phases, weeks or sessions. It doesn’t really matter how you do it but aim for about 10 manageable chunks. You might decide there should be more assimilation type activity at the beginning of a course, data gathering and communication in the middle and more production and assessment at the end. This activity is also an opportunity to consider your learners workload. Will study hours be spread equally through the module or course as is the case here? Remember that in addition to contact/teaching time and self-directed study, learners will also have a number of other things to do in relation to their learning such as administrative tasks (emails, time management planning, printing etc), refreshing skills, extra reading and extension activities. This 'self-directed study' is likely to add up to 10-20% of the total study time and is an important consideration for designers. 7. When you have finished, copy and paste your design notes into the notes panel here - and save the file so you can continue to work on it and refine it over time. I enjoyed this video, however this MOOC course is called " Learning design for 21st centray curriculum, but I got a feeling most of the tools and approach introduced in the last 2 weeks and week3 are more like focusing on course level rather than a programme/curriculum level. I have been thinking how to apply the card game and activity profile activity to a programme/curriculum design which might have many couses at different level, and then I realised it is different, like the dream project I set up for this course is to produce a training curriculum for firstline sale manager, I don't know how to use these tools to map out high level curriculum map, would you please give me some advice? Hi some of the tools give an overview of a course - like the course features whereas others work more at a micro level for example there is a view (the task swimlane) which enables you to map the tasks involved in the learning intervention to the tools and resources being used. This is useful if you want to map out a few hours worth of activities. Hope this helps! Hi Alice - yes I agree with Grainne - this one is better for blocks of study rather than whole curriculum design. For whole curriculum I'd always start with the course features activity, moving to course map (the link to this is in the Course Features page) then this one or something like the Carpe Diem storyboard. Let us know what you decide to do! Yep agree with Rebecca! :-) The different designs enable you to view the design process from different perspectives and different levels of granularity. It's odd, but initially to me, I saw this as a way to help plan out a full curriculum design rather than a specific course, probably because most of my courses are 8 hours or less, and curriculums from 2-6 weeks depending on the group. Most of my full curriculums tend to combine many elements classroom, virtual, web-based, as well as on-the-job - so this activity helped me to plan how much time overall was going to be used. At that point, then can spread out the various actitivies around the individual course topics. Starting this week I looked at the requirements and in the back of my head I said 'multiply the time suggested to get this done and multiply it all by 4'. And then skip some of it. In practice, agency work, I am one of 6/8 people and would make my contribution. Here I am trying to get the entire picture and giving as much of it a go as I can while knowing my weaknesses. If it comes in an Excel sheet I start to feel ill, so just as well I'm scrimbling onto large sheets of paper that I can grab and share just as easily. I have seen there are 19 case studies to look at . Just hang on while I go into my time machine and go through these. Why do I feel like I'm at kids birthday party but there are 400 guests and there are so many party games going on that you can feel a bit lost when you're not actually doing something?! Hi Jonathan, Grainne describes the tools as 'pick n mix' - pick just the case studies and tools that interest you and would be useful. It'll all continue to be here long after the MOOC's finished so you can always come back. With regards to the categories,we do have more guidance (I'll add it once I've found a link) but actually deciding what goes where is quite subjective - when used for design it can only represent what we hope will happen. For example we might design a forum activity and call it communication but in practice only 20% of students communicate on the forum and the rest 'assimilate' or 'produce' a block of text to drop in. When used as an evaluation tool by students it represents their experience (and interpretation of the categories) but I don't think this makes the tool less useful (although would recognise it is quite marmite - people love or hate it), because what it makes us do is focus in on student activity and away from the resources or the tutors activity. Yes comparing the Activity Profile created by the teacher with the one created by the studetns is a really useful exercise. As a learner of Spanish I did this and my smalled column was communication and guess what? That is my weakest competence in Spanish so there is a direct correlation with the types of activities we get the studetns to do and their acheivements or skills!